The next day we arrive at Ashdod, just two days after the latest incident with Israel and the Aid ships to Gaza. The Israeli Navy had in fact escorted the Aid ship into the very same dock we are arriving at. Ashdod has a number of docks but we enter the industrial port and moor alongside container ships and just across from several Israeli Naval vessels. It is unnerving to find out that immediately next to us is the Aid ship that was forced into Ashdod. It is not welcoming in any way. To make matters worse, security is incredibly tight and every passenger has to have a face to face meeting with an Immigration Official. The officials are pleasant enough but the atmosphere is very tense, which is not helped by seeing the occasional passenger being taken aside for a more intense interview . We have arranged to rent a car in Ashdod for three days. We intend to drive to Jerusalem and spend the night there, and then drive on to Haifa where the ship docks the next day. This is one of the highlights of our trip and we are excited to be setting off, but we soon realise that there is a serious drawback to our plan. We are unable to navigate ourselves through a country where all the road signs are in two languages, and neither one of them uses the Roman Alphabet. All the signs are in Hebrew and Arabic, but they are all dutch to us. We are totally incapable of finding our way out of Ashdod. We drive round in circles for 90 minutes. pretending we are enjoying the sights of Ashdod.. The city is spotless, modern, and a tremendous contrast to neighbouring Egypt. But we don’t want to spend our day driving up and down its streets. The only English word we see anywhere is “Exit” which periodically appears on a blue sign. Frustration is setting in and we haven’t even started our journey. Finally we decide that maybe we should follow the Exit signs and see where they lead us. What geniuses we are! The signs direct us to the main road out of town, which then branches off in several directions. 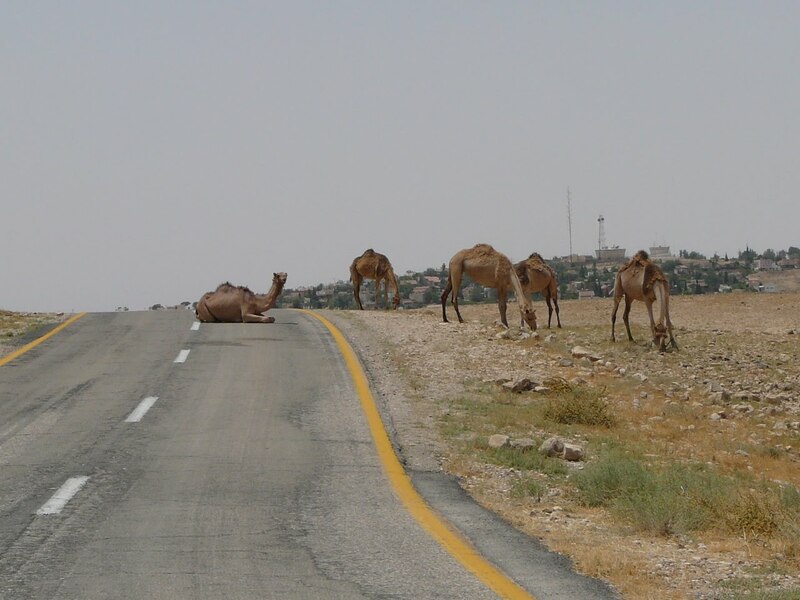 As we drive round Israel we come to realise that this is how their road systems work. The main road out of town is always marked with signs saying exit – which is a definite help and one we are grateful for. But we would be so much more grateful if it would say in what direction it is exiting. It is not until we are out of the City that we can tell whether we are on the correct road, because once out of the City all signs are then posted in three languages, and the third, thank the lord, is English. At that point we can carry on in the correct direction, or head back into town and look for another exit sign. It can be time consuming but we can work with it. However Ashdod has the Mediterranean on one side so the choice of exit roads is very limited and we soon find ourselves on our way. 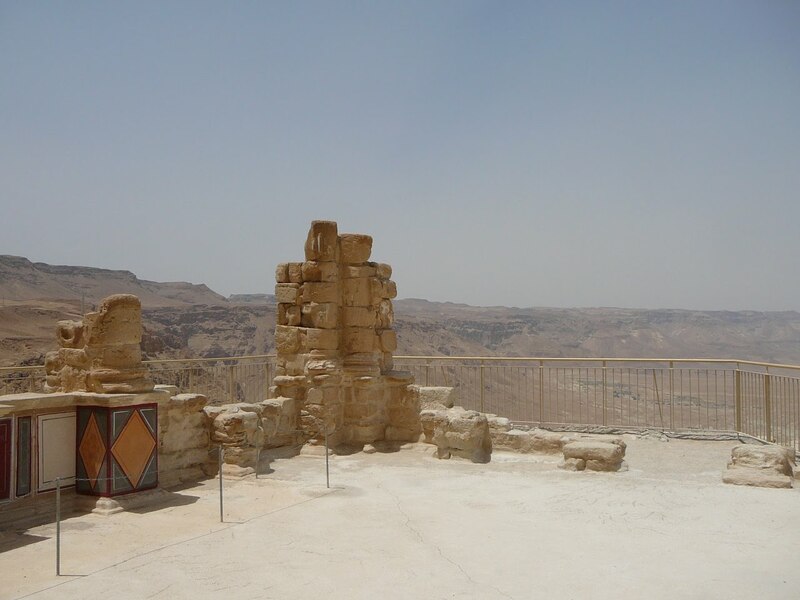 Our first visit is to Masada, and we are delighted to find a large English sign in one of the towns we pass through, pointing us in the direction of Masada. Once out of town, the road narrows and winds its way through a totally barren landscape. There is no curb or edge, and the sand and rocks often encroach on to the paved road. It winds its way through this moon like surface, often taking sharp hairpin bends to get around the steep hillsides. We travel for some twenty minutes without seeing another car. 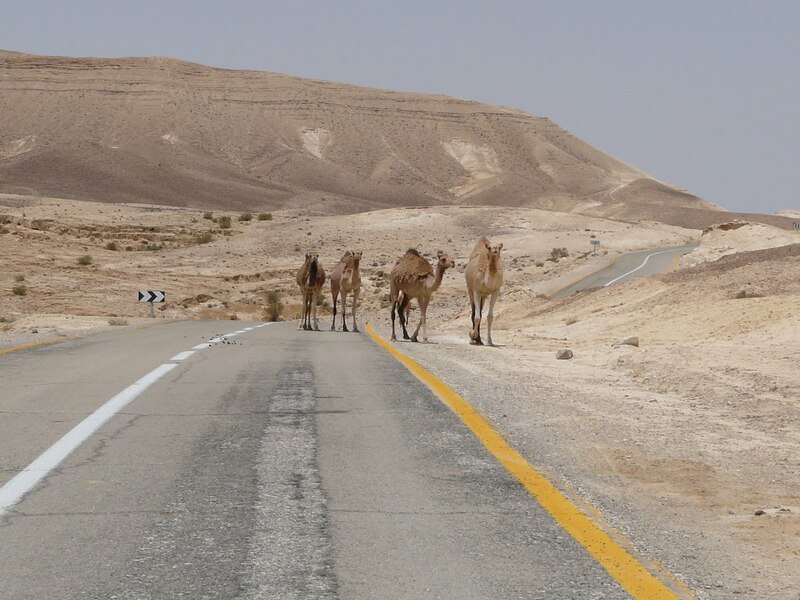 We are getting worried because we know that Masada is a very busy tourist site and there should be an endless stream of tour buses and cars on this road. But there is nothing; no signs, no traffic, no houses, nothing other than herds of wandering camels roaming the desert at will paying no attention to the road, or to us. At one point we find a camel lying down in the middle of the road. It refuses to move for us and we have to drive round it. We are convinced that we are lost, but continue on for another ten minutes until finally we see Masada perched on top of its inaccessible mountain just ahead. Our next stop is to be the Dead Sea, a much easier target than Masada. It is the lowest point on earth so we know the road should be going downhill. We pass through land that seems purpose built for a film based on the Old Testament. It is just as I imagine it, desolate, barren and baked dry by searing temperatures. The occasional cactus is the only living thing to be seen anywhere. The Dead Sea spreads out before us, partially covered by haze. There is nothing attractive about it, but there are huge modern resort hotels and spas built every few miles along the coast. The sea itself is quite dead. It is in fact drying up, leaving the older Hotels and Spas up to two kilometres away from the waters edge. It is an almost comical sight to see a beautiful resort Hotel in one spot and its row of beach side umbrellas and chairs in quite another spot, separated by a huge expanse of dried up sea bed which now has to be traversed by the hotel guests in order to take to the waters. For this purpose, the hotels have provided a transport system consisting of wooden trailers with bench seats on them, that are pulled by tractors down a purpose built track. As you go down the track you pass the old drop off points showing where the waters edge was 2 years ago, 4 years ago and so on depending on the age of the Hotel. But despite this lack of fabulosity, the car parks are packed with vehicles and coaches, and the beaches are full of red skinned tourists. around a cliff and discover right there in front of us, the other side of the inaccessible mountain with Masada perched on top. But, much more encouraging is a car park packed with cars and coaches, a Museum housed in a smart new building and a cable car to the top of the Mountain. At this stage in the narrative, dear readers, I should point out that I am driving and Gordon is navigating. 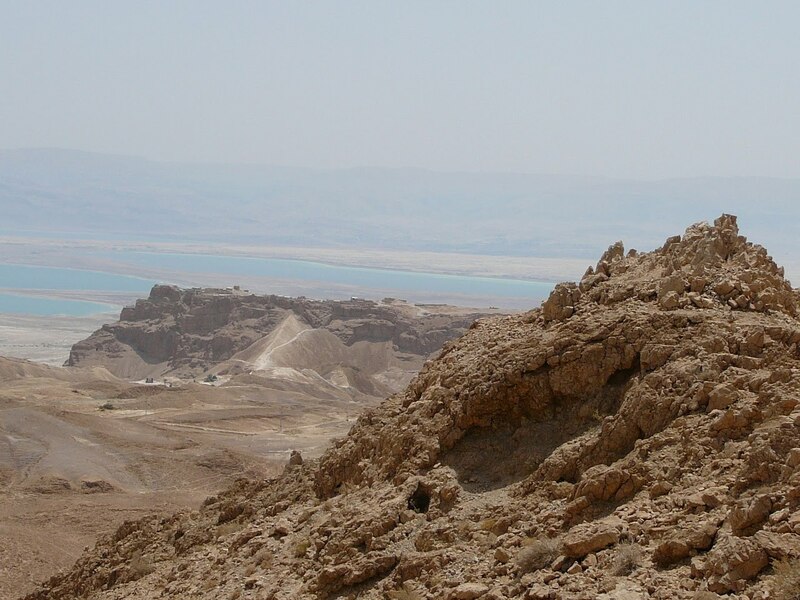 Yes, we have a map, and yes, it shows this access to Masada. But as I am a saint, and quite fabulous, I make no mention of the fact that if he had read the map correctly we would not have had to spend an hour on a narrow dusty windy road to nowhere, and would be much further on in our days journey. Instead I just smile sweetly and mention how delighted I am that we found the correct entry to Masada. The cable car ride to the top is dramatic and the remains of the City are incredible and offer breathtaking views of the Dead Sea and the surrounding country. I am indeed delighted that we found our way up here, but by now the temperature has reached 110 and there is not a patch of shade anywhere. I feel as if I have been put in an oven. But there is nothing refreshing about it. The water is as overheated as I am. It is very shallow and hot enough to cook in. Lying on, rather than in the water, with the top half of my reclining body searing under the sun, and the bottom half being blanched in the water, I feel as if I am still in the oven, but now the broiler has been turned on. I long for the air conditioned car. From here we drive to Jerusalem. It is about another 90 minutes in the car, during which time we steadily climb until we see that incredible city stretching out on the hills in front of us. It is a huge sprawling City. We have booked a hotel hidden just inside the walls of the Old City, which it appears is a very small section of the modern City of Jerusalem. Due to my navigators earlier problems with finding Masada, and the fact that the road signs have reverted back to just Hebrew and Arabic, I am extremely doubtful about our ability to find our hotel. But Gordon excels (it must be said that he rarely lets us down when we are traveling) and somehow manages to get us there without one wrong turn. The City looks inspiring, and as we carefully negotiate our way through the narrow Jaffa Gate entrance to the old City, and through the throngs of people, the stress of the day washes away and a sense of real excitement takes its place. 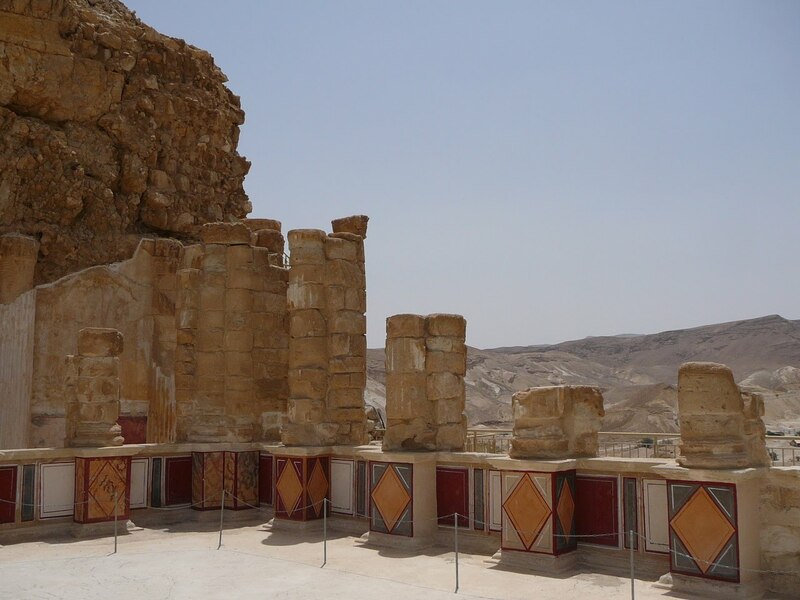 There is no doubt that the restraint you showed regarding the navigators error in finding your way to Masada reference the available map, is the reason you are still a couple after all these years. Stay cool! Did you try walking on water also? I bet you could have, especially if you had held hands! It is great to get lost sometimes..actually all the times…makes you enjoy the moments..I sure am enjoying it with you two…Andrew; you are saint!!! What a fabulous experience! Have fun in Haifa!